‘Tis the season to pull up a stool for cocktails and catching up. 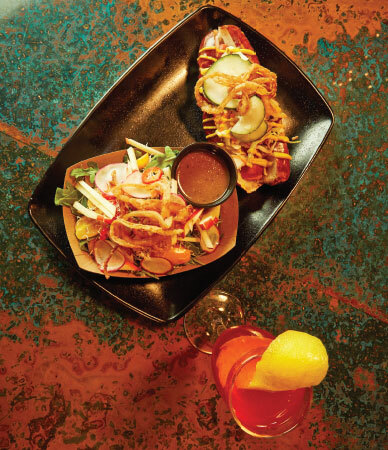 Fortunately, bar food has evolved far beyond the plate of nachos to delectable fare to share and savor. 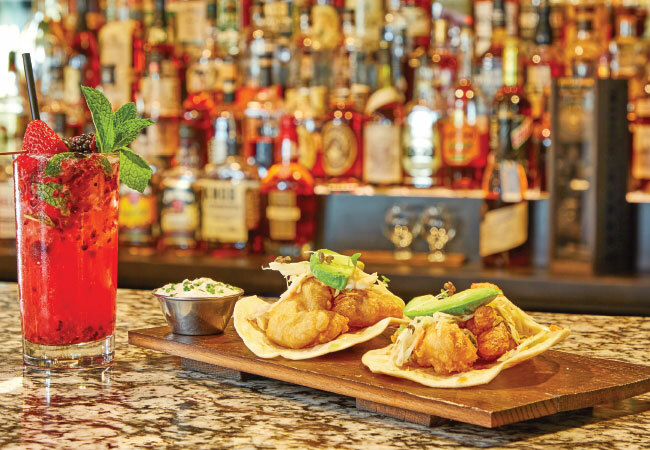 “To me, bar food usually refers to something that’s casual, that could be held in the hand and isn’t eaten with a fuss,” says John Varanese, chef and owner of Levee at River House. But the truth is, he has gone to a bit of a fuss to create gastropub bar food in keeping with his reputation as one of Louisville’s top chefs. (Think Varanese and River House.) Those hand-held appetizers he’s referring to include a grouper cheek taco, sliders, flatbread, tuna ceviche and short rib nachos. If you think a top chef wouldn’t waste his time with pork rinds, you might be right except Varanese jazzes them up with barbecue seasoning. Oysters on the half shell fall into his hand-held appetizer category. Hold them in your hand and slurp them out of their shells for one of life’s most fleeting treasures. 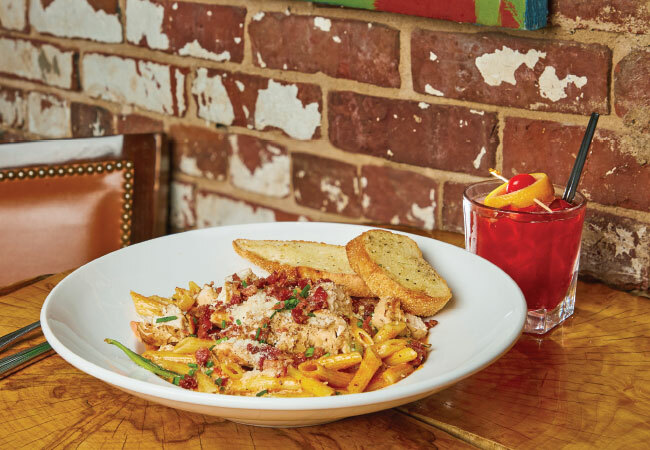 Levee regulars aren’t shy about pairing any appetizers on the menu with loaded fries. Varanese didn’t have to think long about the name of the dish because they’re well, loaded, with cheese, scallions and maybe the best-thing-ever, bacon onion jam. The food at Butchertown Social isn’t easily defined. That’s on purpose and it’s the way Executive Chef Connie Hartsock likes it. “I don’t want a label. We’re kind of all over the board. Some Asian, some burgers, some wings, some salads,” she says. Any way you look at it (and eat it), the food isn’t fancy, but it also isn’t ho-hum. The Korean Cuban (gochujang/beer braised pork, ham, Swiss, kimchi aioli and house-made pickles on Italian bread) is a good example of her penchant for twisting the expected. That doesn’t mean there isn’t something positive to be said about chowing down on all-American familiar fare like the Social Dog (a frank, tobacco onions and some other tasty stuff on a pretzel bun). Vegans, you’re gonna love her too, especially her arugula salad and veggie burgers. Butchertown Social, a public house-inspired spot, serves up cocktails and craft beers to enjoy with live music, art exhibitions and pub trivia. Decca encompasses the vitality and energy that infuses the arts district of NuLu. The restaurant’s chef and owner Annie Pettry and Executive Chef Cody Stone are culinary luminaries who are masters at orchestrating a panoply of flavors both in the historic building’s two dining rooms and downstairs in The Cellar Lounge. The Cellar’s Bar Bites menu features dishes such as sweet and salty caramel corn; a house pickle plate with beet pickled farm egg; warm Spanish olives with preserved lemon; grilled cheese on sourdough with Fontina, caramelized onions and apricot agrodolce; shoestring frites; a farmstead cheese board; and grilled spare ribs with North African spices and honey gastrique. The Small Bites menu is complemented by creative cocktails that use fresh juices and house-made syrups and tinctures. The drinks reflect the team’s passion for adhering to seasonal ingredients and for supporting small batch distilleries and local breweries. Seasonal and classic cocktails join Decca originals such as The Waysider, which will have particular appeal to bourbon lovers, and the fresno chili-kicked up Chupacabra, with mezcal and ginger. Vodka, citrus and some bubbly are the perfect partners in the neighboring friendly Fresh Prince of Butchertown. 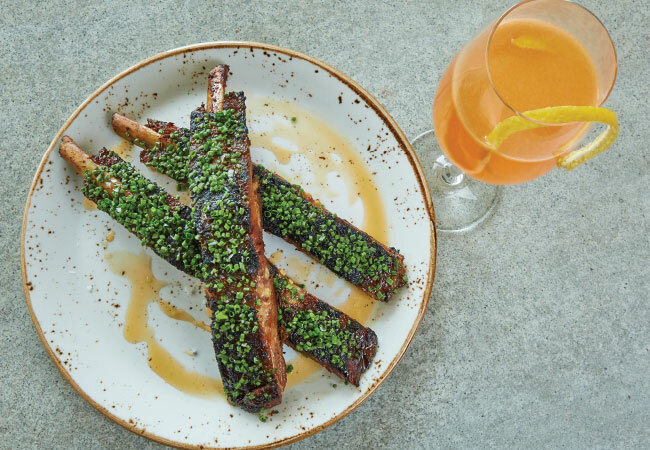 If you’re not lucky enough to be planning a holiday trip to Provence, you can at least have a taste of the experience at Brasserie Provence where Chef Patrick Gosden’s bar menu will make you absolutely giddy at Happy Hour. 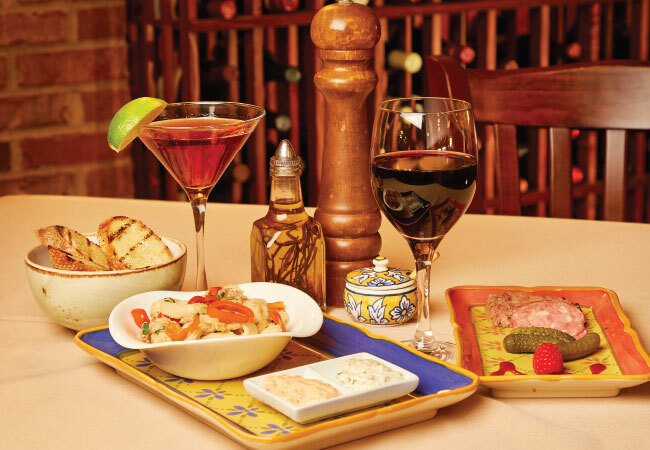 Select from special appetizers like country pâté, garlic sausage, cornichons and grilled baguette; goat cheese, tomato and arugula flatbread; French-style sausage pizza; and fried calamari. “There are two styles of happy hours, those in a sports bar with loud music and televisions blaring, and ours, which is quieter and relaxing,” says owner Guy Genoud. He and his staff are happy to serve anything from the menu at the bar. So, your new idea of bar food can include French onion soup, escargots, grilled ahi tuna, black bean cake with potatoes and ratatouille and crab cakes. Stop in on Tuesday for the pork rib-eye special or on Friday for bouillabaisse. Bar food is always great to share with friends but if you’re flying solo, you can make fast friends at Brasserie Provence. Genoud could be one of them. And feel free to strike up a conversation with the bartenders. They’re some of the best schmoozers in Louisville. The first surprise you’ll encounter at Troll Pub Under the Bridge is Louie the Troll, an 8-foot tall jovial troll who stands guard at the entrance. There are more surprises inside, the kind you can eat. You don’t have to start with the frickles, but we say go ahead because it’s not everywhere you can find fried pickles with chipotle-lime dipping sauce. Try the chicken and black bean quesadilla, pizza, meatball sub, chili and the beer cheese that’s a very big deal. The Pot Roast Poutine is a plateful of decadence---fries and beer cheese topped with pot roast and gravy.